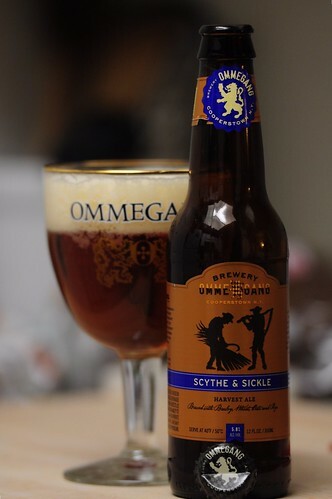 Ommegang Scythe & Sickle, originally uploaded by adambarhan. A: Pours a dark burnt orange with a medium soft white head, some nice lace. S: Yeasty, musty grain, grass, hint of herbs. T: Very bready biscuity malt flavour, white pepper, grassy hops. Hint of orange, rye spice and some assorted citrus. M: Crisp, medium-bodied, frothy, easy drinking yet feels big for it’s ABV. O: An interesting beer. I like biere de gardes, and it’s cool that Ommegang put it in a 12 oz. bottle, so this didn’t cost $10 to try, they should do that for all their releases.